Bravura Solutions are a leading global supplier of finance software, business & strategic consulting services. Bravura occupied two floors of their existing tenancy, having gradually expanded into neighbouring tenancies, resulting in staff displaced over multiple floors and occupying spaces which where not functional to their working requirement. 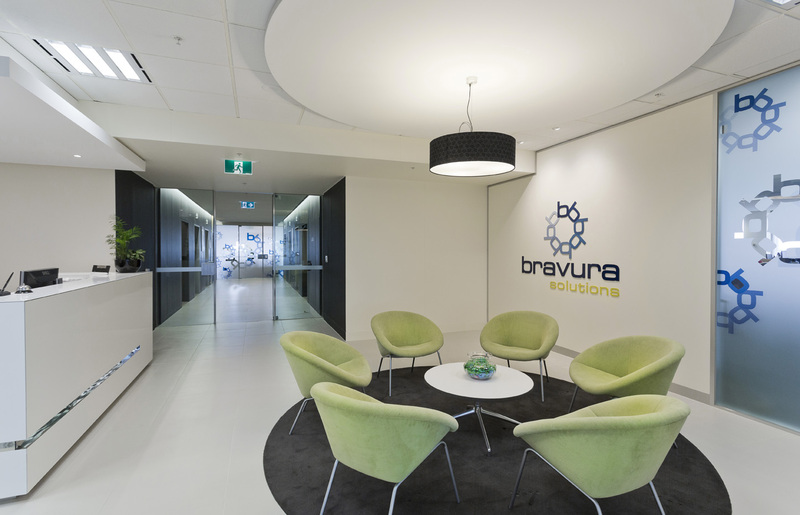 Bravura wanted to accommodate all staff on one level in their new tenancy. This was also an opportunity to roll out the company’s fittest guidelines that had previously been established for the Sydney office. Company management recognised the importance of staff culture, and therefore wanted a dedicated breakout area. This space is strategically placed at the junction of high traffic flow areas with direct access from the lift lobby, and the two main office areas. The majority of staff are in an open plan environment, taking advantage of the park and bay views, & natural light.